Endless work. Endless chores. Endless memories. That is the life of a homesteader. And having children in the midst of all the work can complicate things by adding more work and redone work. As parents, we may dream of a day without complications. A day where we can go and get the job done without a hitch or interruptions. 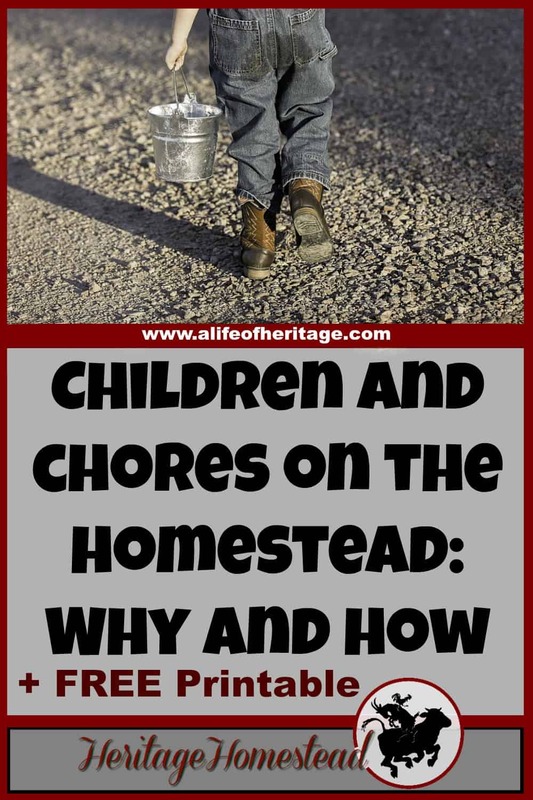 Why should children be involved in the process of your homestead and all the chores involved? There is nothing more that can puff up the chest of a young child than being asked to help with a “big” chore. There is a pride that is ingrained and born in us to feel a deep happiness at accomplishing the task at hand. And a child has the unique and beautiful ability to shine, to truly beam at their accomplishments. Regardless of how old a child is and how they view their “chores”, they need this responsibility. The responsibilities will in turn teach them discipline, the ability to be a self-starter and very necessary life skills. Our great nation needs this. Our nation is in need of our young people to grow up with the knowledge of responsibility, faithfulness and the ability to work. These very rudimentary life skills are becoming few and far between and it is affecting the health of our nation. 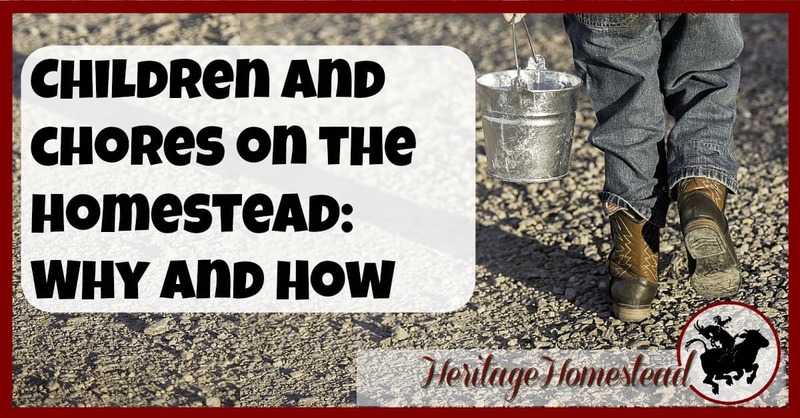 How can you create an environment for children to be involved in chores on the homestead? Children should be apart of it all. A young child on the farm will have experienced more than most children their age. The death of animals is not totally understood but it is a matter of fact. Poop and the clean up of the ever-present poop are a part of everyday life and conversation. Knowing where milk and eggs come from and even knowing that the mean rooster is on the dinner table, doesn’t even cause a quiver. When kids are experiencing all of this, they begin to realize that it is just a part of life. It’s just what happens and it’s done without a fuss. This can be hard for adults. We get in our cross-off-the-list-get-er-done mentality and forget to have fun. We can learn so much from children: slow down, smile, and even give a belly laugh once in a while. Our milk house has a dirt floor and it is littered with dump trucks and boy tools. I struggle with this every time we milk. “Don’t get the dust up! I’m milking! Be careful! Please stop, go slow!” But he is having so.much.fun and for the record, he is really careful with the dust. He has stop lights and go lights for the goats as they enter and exit the goat house and he has a beautifully fun imagination as we sit and milk our girls. Stop. Make time for your child’s hearts desires. This can also be a challenge when there is so much to do. But children need to know we care and are willing to listen, and help them with something they love so much. It may be stopping to saddle a horse and help them ride. Or sitting in the dirt and helping them dig for worms or whatever else they may be “mining” for. Sometimes just sitting on the kitchen floor and holding them close for a moment gives their hearts the fullness needed to keep going without a meltdown. Begin as you mean to go. This is such an important philosophy for our family. Regardless of how old a child may be, it is never too late to adopt this mentality. But when you start out knowing how you want to end up, it makes the vision for your family and children so much easier. It gives the clarity needed when life begins to feel fuzzy around the edges after the umpteenth meltdown. It is “the knowing” that it will work and smooth out with time and repetition. And when children’s needs, cycles and stages enter, there is still that single spotlight you are heading for in the future as you are figuring out the present. You know the popular quote “Dance like no one is watching”? There is music all around us. In the birds and the breeze through the trees. The crickets and bees. The mouse in the corner and the tractor in the distance. The coos and babble of the baby at your feet. It is all music, waiting for a dancer. You are in the lead. So dance. Dance to the music of the milk. And teach your kids to dance right along with you. 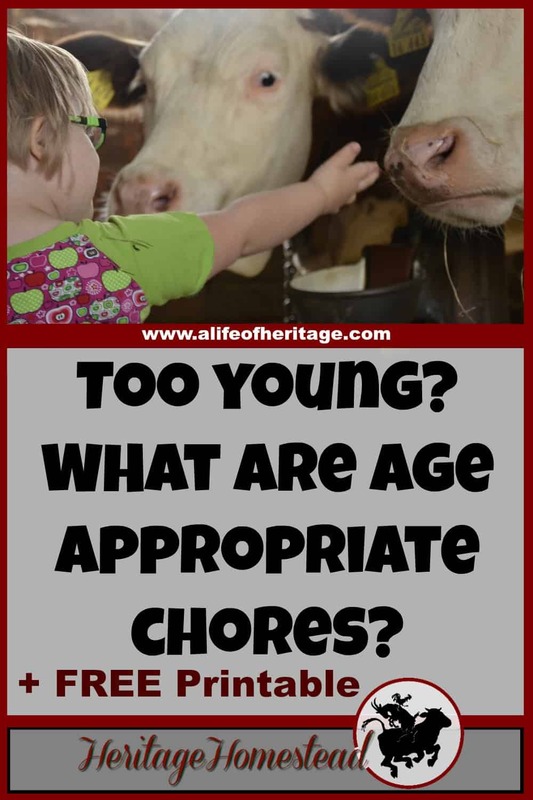 Get the age appropriate chore chart delivered right to your email box. But the best part? 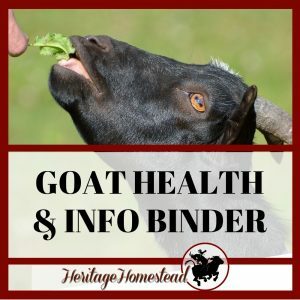 You will also have access to ALL of the resources on our resource page. Check it out below. 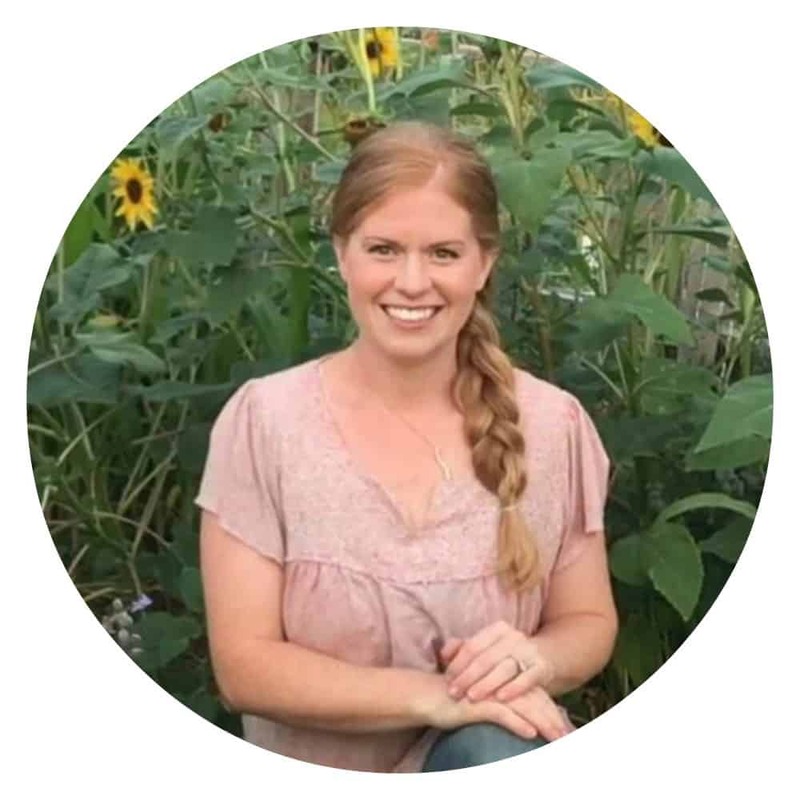 « What Type of a Homesteader are YOU? Take the Quiz and Find Out! GREAT POST! Kids are everything, aren’t they? I agree with every word in this post. Thanks for making me smile on this dreary morning! I agree 🙂 and thank you! It’s a dreary day here too! We are having a blizzard!